“Nong ho”! That’s hello in Shanghainese. So here’s my last post for the next couple weeks. I’ll be home to my birth city of Shanghai. I’m looking forward to checking out the World Expo and of course seeing my family. There will be lots of eating, eating and more eating. I’ll bring back pics of mama’s cooking and my favorite places to eat. 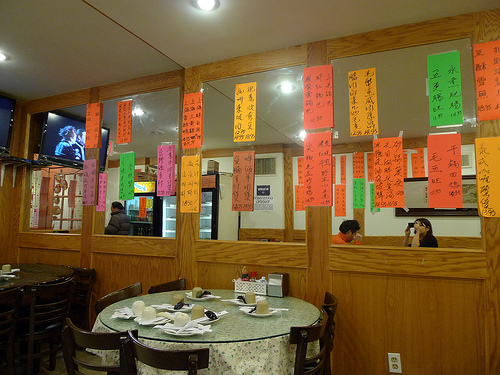 In the meantime, I figured I’d leave you guys with a taste of Shanghai in Flushing, Da Jiang Nan Bei. 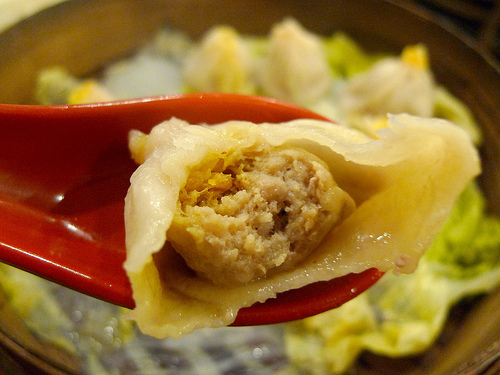 “Moo lei dough” is a classic Shanghainese cold appetizer. This type of vegetable isn’t grown in the states, but you can usually find them packaged at the Asian market’s freezer section. Finely chopped and mixed with marinated bean curd, sesame oil and soy sauce. 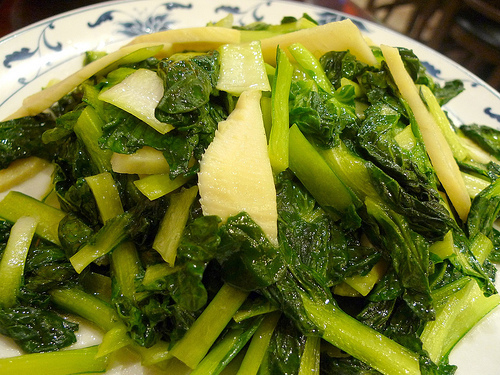 The “moo lei dough” greens are similar in texture to spinach/watercress, but have a really unique and fragrant taste, which is enhanced by the sesame oil. They usually have it in the refrigerator as you walk in, so you can point. Highly recommended way to start your meal. Truly tastes like being in Shanghai, though, it’s usually bought fresh at the market. Another one of my favorites is the Sheperd’s Purse, fresh Bambo, Pork Rice Cake. It’s another green vegetable that’s available fresh in Shanghai, but only frozen in the States. 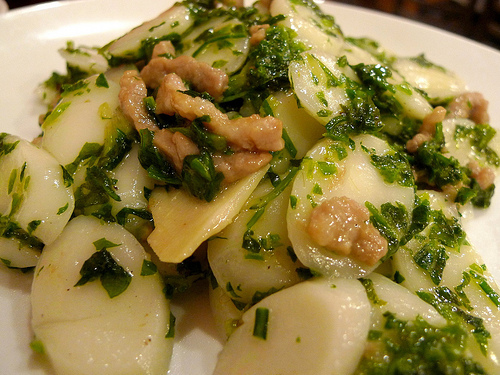 The greens give a hint of fragrance to the soft chewy rice cakes. Well balanced dish with added texture from the bambo and pork strips. I always order this. My mom makes the best Shanghainese Wontons. 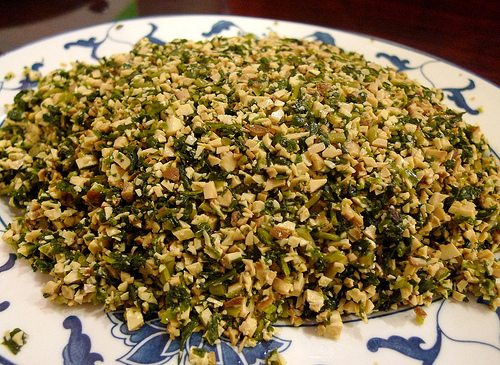 Which also uses Sheperd’s purse greens mixed with ground pork. The one I’m gonna be having in exactly 40hrs is made with fresh veggies, and my mama does a pork soup broth that’s to die for. But I settle for this when I’m here and honestly, this is the best I’ve found so far in NYC. Most authentic. 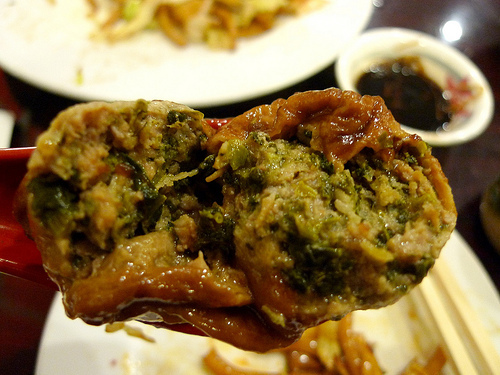 Another home style favorite, a dish my grandma perfected is the “Yo mee gin” Fried Glutinous Balls Stuffed with Pork and Veggies. These store bought glutinous balls are deep fried, light and airy. 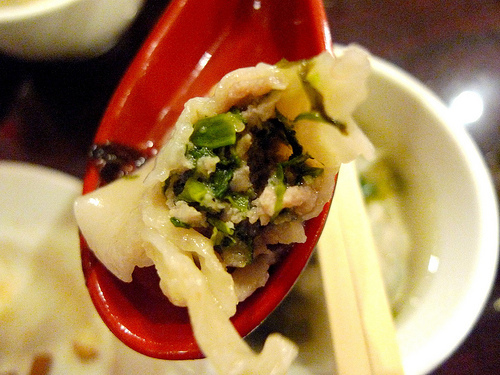 A hole in made in the center while dry, then the uncooked filling is stuffed in with chopsticks. 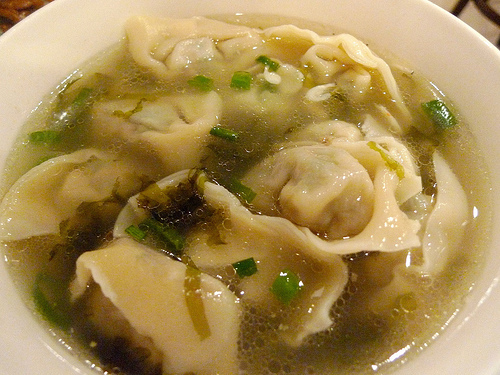 My grandma usually does an only pork version, but here, they have it with veggies similar to the wonton center. 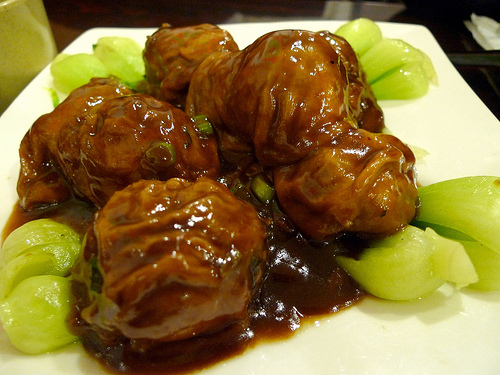 These balls are then steamed with soy sauce. The wraps texture changes with the steam, and turns into this soft, slightly stretchy melt in your mouth wonder, while the inside remains moist. At the restaurant, they put a heavy sweet sauce on top when served, I usually ask for no sugar and minimal sauce, but if you have like dishes that are a little sweet, go for it. 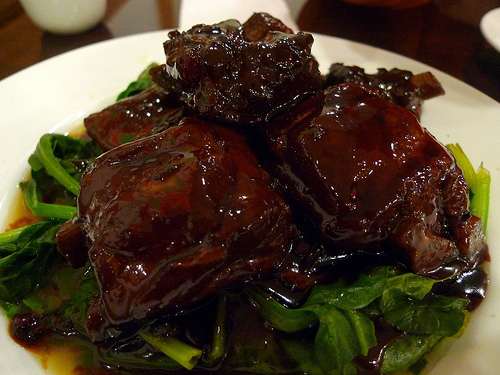 My mama makes a killer Soy Sauce Braised Pork Ribs. Obviously this one can’t compare, specially because of how oily it is and the amount of sugar. Yes, the recipe does call for sugar, but theirs is too much for my taste. With that said, the pork ribs are very tender, fall of the bone, but super moist. I prefer the Grandma’s Soy Sauce Braised Pork Belly instead. They are very tender, fatty but not greasy and the soy sheet knots that come with it absorbs all the flavors and its so great with a bowl of white rice. 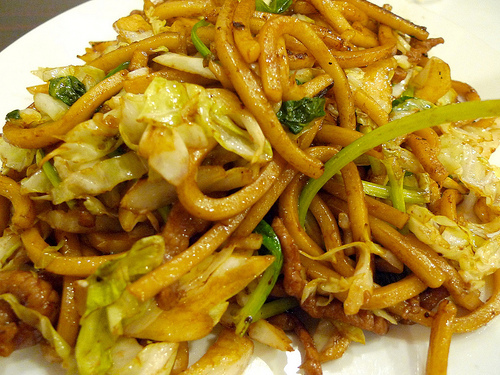 The Shanghai Style Pan Fried Noodles are a little oily, but the wok and fire flavors come through nicely, so I over look that. The noodles are al dente and chewy. The crunchy crisp vegetables add nice texture along with the pork. Add some of that hot chilly sauce on the table and you’ve got a winner. 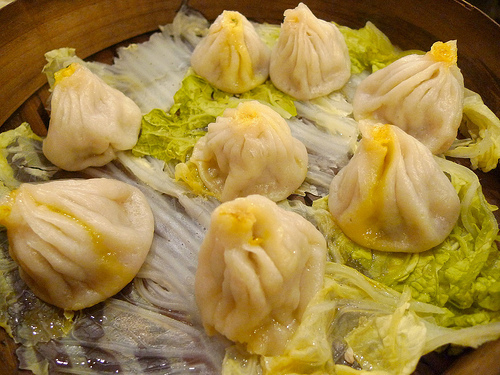 In Shanghai, these Xiao Long Bao, or Soup Dumplings are eaten for breakfast or lunch, rarely do they appear on a dinner table. The Crab Roe Soup Dumplings here are decent, with a good proportion of crab roe and pork. Definitely not as good as Joe Shanghai, but they make it up with all the other local/homey dishes. If you must have soup dumplings go ahead, otherwise, I recommend trying other things. Fresh Bamboo is in season, take advantage of it and have it simply stir fried with leafy greens. It’s crunch, and umami flavor is totally different from your usual chinese take out canned versions. If your feeling adventurous maybe try the Spicy Pig blood and things Casserole, Salty egg yolk with Crab, Cold Soy Fish, Glutinous squares”kao-fu” with mushrooms or Soy Bean Paste whole Fish. i love authentic food! have you checked this place out http://www.xianfoods.com/ ? i hear good things and need to hit it up soon! beautiful pictures! everything looks sooooo good! ive been wanting to go to that place…. Good review. Do you know where to go for good eel with chives in nyc? I forgot if this place has it, I think they do, but the one that I use to order all the time was Joe Shanghai in chinatown… as I recall it was quite good, but it's been a while.